You have added A Pearly Touch Embellished Lace Dress in Blue Mint into shopping cart. This dress is delightfully classy and girly! We absolutely adore this delicate lace pearl and rhinestone embellished dress. The A Pearly Touch Embellished Lace Dress is fully lined. This dress has an A-Line cut, scooped neckline, sleeveless, and an empire waist. This dress has a delicate pearl and rhinestone embellishment along the neckline. The fabric is a delicate embroidered lace overlay. A hidden side zipper completes this dress. This dress is perfect to wear to a wedding or any dressy event. This dress would even be a cute bridesmaid dress. You will feel girly and classy in this cute A-line dress! Pair this with heels and pearl earrings. Details: Fully lined. Hidden side zipper. 100% polyester. Dry clean only. Small measurements: Length from top of shoulder to hemline: 32”. Bust: 32”. You have added A Pearly Touch Embellished Lace Dress in Blue Mint into Wishlist. You have added A Pearly Touch Embellished Lace Dress in Blue Mint for Stock Notification. 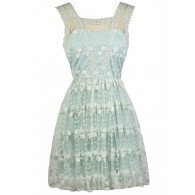 You have set A Pearly Touch Embellished Lace Dress in Blue Mint as a loved product. You have removed A Pearly Touch Embellished Lace Dress in Blue Mint as a loved product.